Welsh Tourist Board Four Star. 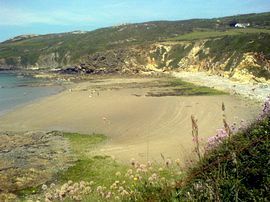 Blue Flag sandy beach, coastal footpath, pub, restaurant and cafe - one mile away. Relaxing location, Perfect for families; children welcome. Situated on the edge of the hamlet of Rhydwyn, in an Area of Outstanding Natural Beauty, this holiday home is perfectly located to explore not only the beauty of Anglesey itself, but also North Wales. 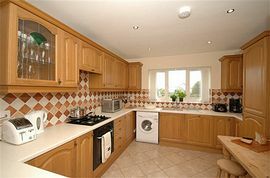 The whole holiday home has been furnished to a high standard, is well maintained, and is very well equipped with modern appliances. It has also been furnished with families in mind. 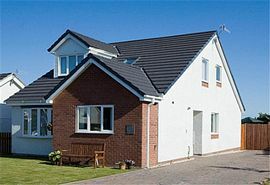 The owners have used their experience of staying in holiday rentals over many years, with their children, to provide what they consider ideal holiday accommodation. All gas and electricity and bed linen included. Washer/dryer, Fridge, Freezer, Dish Washer, Microwave, coffee makers, toaster, iron/ board, hair dryer. Towels available upon request at an extra charge. Off road parking for 3+ vehicles. Wireless broadband Internet access is included contact the owner in advance. Kitchen - Gas hob, Electric fan oven, Fridge, Freezer, Dishwasher, Washer- dryer, Microwave, Breakfast table, Portable TV. 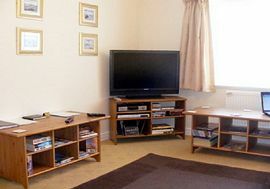 Lounge - TV Sky Freesat, DVD player, CD player, Modern comfortable sofas for eight, View to front lawned garden. Dining room with Dining table for eight, TV, Patio doors leading to rear, enclosed, lawned garden (south facing) with garden furniture and barbeque. Bedroom 2: 2 single bunk beds - pine. Full sized. Bedroom 3: Twin single beds - pine. Bedroom 4: King-Sized bed - pine. Please visit our web page for updated availability and prices. Roomy, downstairs bedrooms and shower room. 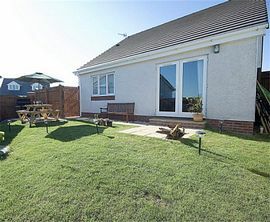 Bbq, patio, seating, enclosed rear garden - can be locked. Local Services: Shop / po 2 mile. Tesco deliver. bus stop 2 yards. Some reduced rates for smaller parties and par weeks.